Looking for a cleaning lady? This is the place to find one. Anyone looking for a cleaning lady soon realises what a time-consuming and nerve-racking an undertaking it can be. Even these days now that the Internet has replaced newspaper ads and notice boards and things should have gotten easier. How do you know if a cleaner is trustworthy? Who is reliable? You can only really be sure if a certain cleaner comes recommended by friends. But cleaners like that are rare and often already fully booked. Self-employed cleaners like the ones you usually find advertising online are often unreliable or the result isn’t as expected. 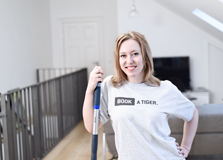 Look for your cleaning lady on BOOK A TIGER, and you can lean back and relax because your search has come to an end. We only send you fully salaried and trained personnel, selected according to the highest quality standards. We’re a reliable partner in the field of cleaning services to have by your side. Stop poring over ads in the paper or the Internet and then systematically contacting cleaning ladies. No more need to get annoyed when there’s no one on the other end when you call, appointments are cancelled on short notice or the person just doesn’t show up. If you choose us, you’ll quickly realise that searching for a cleaning lady couldn’t be easier. Searching with us is easy because everything is done online. You can book our service from the comfort of your couch or via our app when you’re on the go. First enter your address, and we’ll let you know right away whether we can generally send a cleaning lady to homes in your area. Then enter the cleaning schedule you’d like for our Tiger to follow: weekly or biweekly. Then enter your preferred appointment and voilà – you’ve found your new cleaning lady. An important note on this: even once you’ve picked a cleaning schedule, you still remain flexible. You can reschedule, cancel or add more appointments at any time – all online of course. Also interesting for many people: if you’re particularly pleased with one of our Tigers, we can make sure they’re always assigned to your apartment in future. That way, you have your personal cleaner whom you can trust and who knows what’s important to you. You looked for a cleaning lady and found one on our site. That should be the end of your work. But even if that’s really the case, we continue to make sure everything goes smoothly. Because a high quality of cleaning and excellent overall conditions are crucial for us. Instead of you looking for your own cleaning lady, we take care of the selection process for you. We take a close look at each applicant before employing them and sending them to your home. The first step is an extensive interview, during which the applicant has to convince us of their skills, but also of their motivation. Then they get to prove their mettle during a thorough trial cleaning. And finally, if they have a spotless police record, then there’s nothing standing in the way of their employment at BOOK A TIGER. But of course we continue to monitor the cleaning quality at our customers’ homes. Regular training and feedback sessions ensure that your apartment always ends up just as clean as you want it to be. We train our Tigers systematically and efficiently so your apartment not only ends up hygienically clean, but it only takes as much time as is really necessary. First, it’s time to tidy up, followed by dusting. Once all the top surfaces have been cleaned, it’s the floors’ turn to be wiped and vacuumed. The kitchen and bathroom come last. Part of our standard cleaning repertoire is also airing out the apartment, loading/emptying the dishwasher or washing the dishes by hand, turning on the washing machine or bringing down the rubbish. If you’d like us to take care of additional services such as cleaning the fridge or ironing, we’re happy to oblige. Another benefits of BOOK A TIGER compared with the black market: our employees all have liability coverage. So even if something ends up broken by accident, we’ll reimburse you for the damage. Through our partner, Ergo Versicherung AG, damages up to an amount of €3,000,000 are covered. All you have to do is submit a damage report to our customer service, and we’ll take care of everything. Our customer service colleagues are also the right address for all questions and comments you may have.